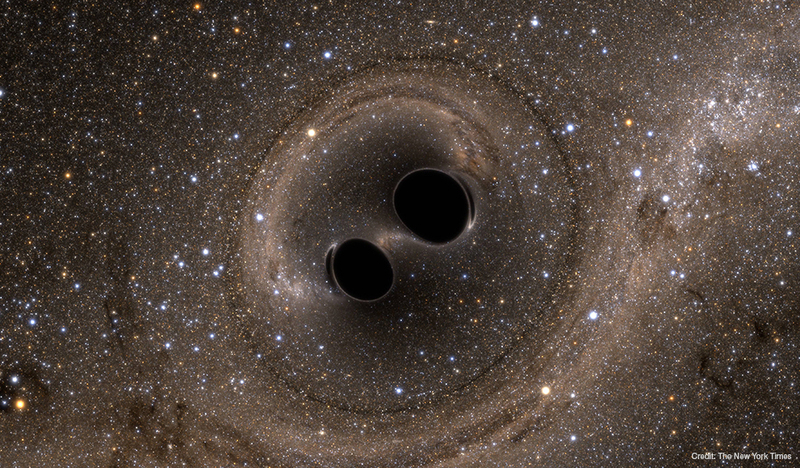 If two black holes collide in space and no one is around to hear them, do they make a sound? This is not a question philosophers need ponder any longer; it was announced last week that scientists, for the first time, were able to detect gravitational waves resulting from the collision of two black holes, and hear and record the resulting sound. The cosmic event, which occurred a billion light-years away, resulted in what has been described as a fleeting chirp or a rising note and fulfilled the last prediction of Einstein's general theory of relativity. Nergis Mavalvala '90, a member of the group that made the discovery, described the sound as, "Sweeter than the most beautiful musical piece I might ever hear." Amidst an explosion of global media coverage, Mavalvala spoke to NPR’s On Point, and the Pakistan-born quantum astrophysicist was featured in her native country's Daily Times. “Even when Nergis was a freshman [at Wellesley], she struck me as fearless, with a refreshing can-do attitude,” Professor Robbie Berg told the outlet. Mavalvala has been part of the Laser Interferometer Gravitational-Wave Observatory (LIGO) project for 25 years. She joined LIGO as a graduate student in Professor Rainer Weiss's lab at MIT in 1991. "For my PhD, I built a prototype interferometer to design and test a controls scheme for precisely positioning the LIGO mirrors," she said. She continued her work on the project at CalTech as a postdoc then research scientist before returning to MIT as a professor in 2002. "In recent years, my research has focused on how to manipulate the quantum mechanical properties of light to improve the sensitivity of the LIGO interferometers," she said. She and her group are part of a team that tries new ideas for, and then designs, builds and commissions the LIGO detectors. Sheila Dwyer '05 joined the LIGO project as a research assistant in Mavalvala's group around eight years ago. She is now a CalTech postdoc at the LIGO Hanford Observatory in Hanford, Washington. "Sheila's PhD research established an important new technology for reducing the noise in the LIGO interferometer by using exotic quantum states of light," Mavalvala said, adding that Dwyer "has been one the key scientists who got the Advanced LIGO detectors operating at the sensitivity they did for the discovery made in September." Dwyer explained, "I work on the LIGO detectors themselves, which need to make the most precise measurements of strain that have ever been made in order to detect gravitational waves. I've spent most of the last three years commissioning the detector here at Hanford, which means making all the various parts of the interferometer work together well." The team's discovery marks a number of important milestones: this is the first time gravitational waves were directly observed; the first time a black hole system like this one has ever been observed; and the first time scientists have been able to compare such a system to theory. "But perhaps most importantly, we have turned on a completely new sense with which to study the universe," Mavalvala said. "For me personally, this has been 25 years in the making," she said. "But I have now experienced the greatest privilege a scientist can have: to be part of a truly game-changing discovery." For Wellesley students, she had this piece of advice, "If there's one thing every student should do while at Wellesley, it's to get a taste for research and open-ended inquiry." Mavalvala said no single event in her education was as pivotal as her first experiences in a research lab, which were experiences that happened at Wellesley. "This is where I first got turned on to experiments in a research setting. I learned to design and build scientific apparatus, to persevere even when it didn't behave, to nurture it into a smoothly humming machine capable of teasing out Nature’s secrets," she said. Mavalvala added she was able to attend Wellesley because she received a substantial financial aid package and said, "This is one of the most life-changing things any educational institution can do for a student. I hope every student and every alum and every person of means who can give back to this system, does." Dwyer, too, said she is grateful for her time at Wellesley and said she felt her experience was great preparation for what she’s doing now. "The working and learning environment at Wellesley let me build confidence without having to worry about some of the things that can be difficult about working in a male-dominated field. Some of those difficult things are subtle and hard to recognize; having my time at Wellesley as a frame of reference is incredibly helpful." Dwyer added, "The only advice I'd have to students today is to enjoy your time at Wellesley."